The second-largest faction in the ruling Liberal Democratic Party on Monday proposed holding a national referendum on constitutional revision before the Upper House election next summer — a move apparently designed to generate political momentum to revise war-renouncing Article 9. The proposal was made by the faction led by Deputy Prime Minister and Finance Minister Taro Aso. 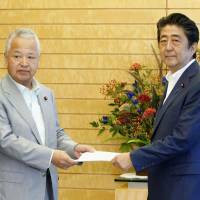 Prime Minister Shinzo Abe received the proposal from former economic policy minister Akira Amari at the Prime Minister’s Office. Both are long-time allies of the prime minister. Aso’s faction also proposed that measures be taken to improve Japan’s industrial competitiveness and promote realistic diplomacy based on the Japan-U.S. military alliance. Kyodo News quoted a member of the faction as saying Abe agreed with the “economic and foreign policies” endorsed by it. Whether the prime minister also agreed to kick off a national referendum by next summer is not immediately known. 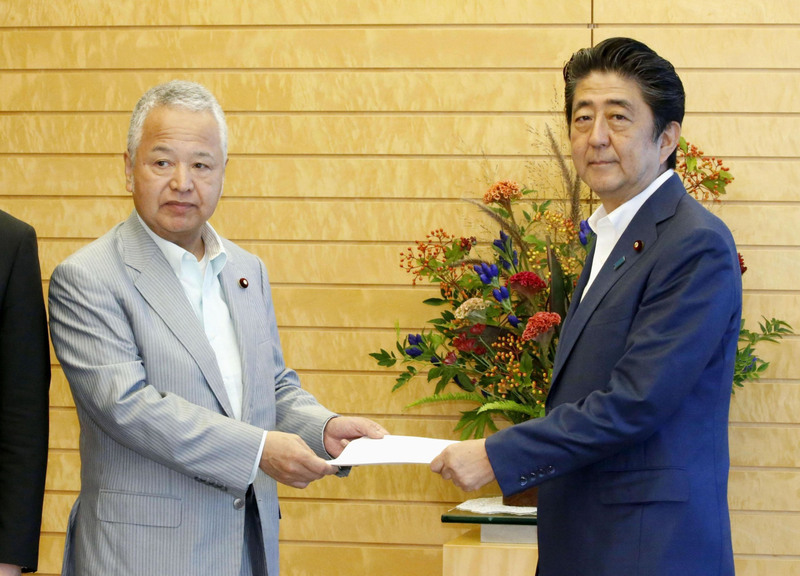 The proposal was immediately met with opposition from former Defense Minister Shigeru Ishiba, who is set to run against Abe in the LDP presidential election on Sept. 20, which will effectively determine the next prime minister. Ishiba said the link between constitutional revision and the public’s psyche is a sensitive one. “Political schedules should not be prioritized. 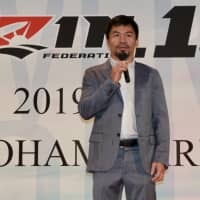 If revision is related to pacifism, deep understanding of the issue is needed,” Ishiba told a news conference arranged to explain his policy proposals ahead of the election. The LDP should try to win a consensus among as many parties as possible before it proposes any revision to Article 9, Ishiba said. 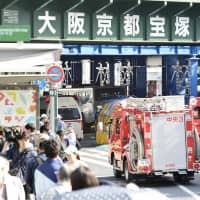 Abe has argued that Article 9 should be revised to formalize the legal status of the Self-Defense Forces and put an end to the academic debates about their constitutionality. Originally, Ishiba himself had called for more radical revision of Article 9 that would just delete the second paragraph entirely. But with the LDP race approaching, Ishiba has begun to advise that the Diet not rush to revise Article 9 and instead prioritize economic issues, in particular those to aid rural areas suffering from depopulation. At the same news conference, Ishiba also criticized Abenomics, the prime minister’s three-pronged economic policy, saying that ultra-loose monetary easing is “a shot in the arm” and unsustainable. “What is important is to raise the growth potential of this country. We need to raise the potential of small firms and rural regions, making them the growth center of the economy,” Ishiba said. Ishiba also proposed the creation of two government-linked bodies to promote measures to help rural regions and small firms. On taxation, he said that the unpopular and oft-delayed consumption tax should finally be raised to 10 percent from 8 percent in October next year as scheduled, and that the government should take economic steps to counter any adverse effects from it. 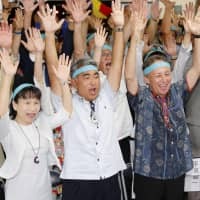 Ishiba, however, did not discuss specific measures to reduce the government’s rapidly growing debt and graying population. He only said the government should put more emphasis on measures to prevent diseases associated with unhealthy lifestyles to curb the rapidly rising costs of running the public health insurance system. Earlier this month, Abe surprised the nation by arguing that the LDP should submit its own constitutional revision proposals to the extraordinary Diet session expected to be convened this fall. Diet sessions on constitutional revision have been stalled by resistance from the Constitutional Democratic Party of Japan, the largest opposition force, and reluctance from the LDP’s junior coalition partner Komeito. But Abe has started pushing for an early referendum in an apparent bid to retain political momentum after the LDP election, which he is predicted to win. For the Diet to initiate a national referendum, a vote of two-thirds is needed in both the Lower and Upper Houses. Article 9 states: “the Japanese people forever renounce war as a sovereign right of the nation and the threat or use of force as means of settling international disputes. But Japan has long argued it can exercise the right to self-defense and maintain the minimum force needed for that purpose because it is the inherent right of any sovereign state. According to the government’s interpretation, the use of force should be strictly limited to the minimum needed for self-defense.